Location: Little Brothers provides companionship and service to elderly women and men living in their homes in several Boston area neighborhoods. The friendly visiting program is really the heart of the efforts at Little Brothers. Through this program, volunteers are matched with an elder with whom they visit three to four times a month for about an hour. Elders and volunteers share time reminiscing, playing cards, going for walks, or sharing a meal. The primary goal of this program is to establish a true friendship between volunteers and elders. In order to accomplish their mission, volunteers must be able to commit to visiting their elder for at least one year. Ages: All ages can participate; an adult must accompany youth under 18. Time Commitment: One hour, three to four times a month for one year. Please join the celebration of the 25th anniversary of the Americans with Disabilities Act, which includes a march, performances, speakers, and family-friendly activities. Bring along the whole family for a fun-filled, family-friendly celebration. This is a FREE public event. A New Orleans Style marching band will accompany the marchers. Feel free to make your own joyful noise. Chanting and noisemakers encouraged. Volunteers are needed to guide participants from transportation drop off to the seating area. Contact: Katherine Blakeslee, 617.695.1225 x 224 or kblakeslee@IHCDesign.org. Volunteers can register online. Throw a Summer Birthday Party! Date/Time: Various dates throughout the year, based on client birthdays. Parties take place from 6 - 7:30pm. Heading Home's client families consist of a single mom with one to two young children, representing the demographics of a homeless family in Massachusetts. Like all of Heading Home's programs, these shelters provide families with a safe and homelike environment where they can receive the critical support they need to work towards permanent housing. Volunteers can help provide what every child deserves -- a birthday party! Volunteers provide a cake, decorations, goodie bags, and one to three gifts, as well as plan a party activity for the birthday boy or girl and the other shelter residents. Ages: All ages can participate; an adult must accompany youth under 16. Time Commitment: Approximately one and one-half hours. Date/Time: Saturday & Sunday, July 18 and 19. There are volunteer opportunities Friday, July 17 through Sunday, July 19. There is a pre-race pep rally and packet pick-up on Saturday starting at 4pm. Race start times are Sunday between 7:50am and 9:45am depending on the age of the participants. The New England Kids Triathlon is one of very few kids triathlons sanctioned by USATriathlon in New England during 2015, and it will be the largest kids triathlon ever held in the Northeast. Race distances are set by the USATriathlon and are designed to be challenging but achievable for kids. Ages 5 - 10 will swim 100 yards; bike 3 miles; and run 0.5 miles. Ages 11 - 15 will swim 200 yards; bike 6 miles; and run 1 mile. The swim will be in the M.I.T. pool, the bike course will be on Memorial Drive, and the run course will be on campus. All aspects of the course will be closed to traffic with the safety of the participants the primary objective. One of the hallmarks of Kids Triathlon, Inc. is our goal to attract as many first-time triathletes as possible. Triathlon is one of the fastest-growing sports in the world, and this event introduces kids to a healthy, positive lifestyle that encourages daily exercise, good nutrition and making the right choices. It is a sport that rewards preparation, strength, endurance, and attention to detail. We want to connect with kids who would not otherwise even dream about competing in a triathlon. At the center of this effort is our Team Fundraising Program through which we encourage schools, neighborhoods, teams, churches, companies, and other organizations to form teams of 10 or more kids. In return for participating as a team, Kids Triathlon donates $10 per child back to the sponsoring organization as a charitable fundraiser. Ages: Children ages 5 - 15 can participate in the triathlon and teens 16 and older can volunteer. Time Commitment: Depends on whether you are a race participant or volunteer. Contact: shelda@kidstriathloninc.org. Click here for race registration and click here to volunteer. Binky Patrol is devoted to reaching out to needy children, including HIV-positive, drug-addicted, neglected, abused, or children experiencing trauma in any way. Binky Patrol volunteers bring a caring, loving touch by creating and delivering handmade blankets, "binkies", to enrich the children's lives and to meet their most basic needs of warmth, security and comfort. To reach them, "binkies" are distributed through hospitals, shelters, and social service agencies. Binky Patrol volunteers make blankets that can be crocheted, sewn, knitted, tied, and even quilted for ill and traumatized children. Please use machine washable and dryable fabrics and yarns. Check out their website for links on how to make a Binky. The Needham Community Farm provides educational opportunities and grows fresh produce for those in need. Volunteers help on Saturday mornings during the growing and harvest season. This is a drop-in activity that does not require a long-term commitment. The Needham Community Farm is also looking for a regular weeding crew to volunteer once a week. This is a great way to help a local nonprofit deliver its services to our community. Teens are welcome to participate in the weeding crew and can earn community service hours! Ages: Youth are welcome for this intergenerational activity. Youth 14 and older can be dropped off and picked up at 11:45am. An adult must accompany volunteers under 13. All volunteers need to bring either a completed adult waiver or youth waiver the first time they volunteer with Needham Farm. Location: Flexible for volunteers. Dean's swim will start and finish at 1st Bridge on State Beach in Oak Bluffs, MA. As the centerpoint of a national crowd funding campaign, NoticeAbility's Founder and Executive Dyslexic, Dean Bragonier, will make the first official circumnavigation swim of Martha's Vineyard. Supported by local and national media coverage, celebrity involvement, and broad community participation, Dean will swim to raise awareness and resources to support NoticeAbility's mission. You and your family can become a part of this courageous endeavor while raising awareness about learning differences. Create a bake sale, host a lemonade stand or start a campaign of your own for Dean. You can have fun tracking his progress too! Contact: Dean Bragonier, 508.939.1900, dean@noticeability.org. Click here for more information on Dean and his swim. 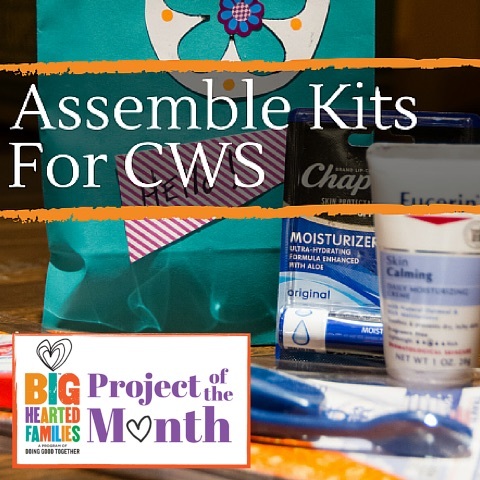 CWS Kits are small packages of supplies assembled by volunteers and shipped to people in need around the world. Assembling these kits is a great activity to add kindness to a summer barbeque or other summer family get-together. Church World Service (CWS) collects School Kits, Hygiene Kits, Baby Care Kits and Emergency Clean-up Buckets and distributes them worldwide to those in need. Click the above links for instructions for assembling and shipping the kits. You can make it a party and divide the cost among many families. Doing Good Together's Assemble Kits for CWS page offers suggestions for reflections, resources and ways for your family to take it further.